Forget the old rose-baby's breath combo. Today's boutonniere designs are fresh, original, and reflective of the men who wear them. Lime and chartreuse are the "it" hues of the moment, and there are plenty of flowers and foliage to satisfy the demand for this color trend. This groom's boutonniere features a lively green button pom blossom, a glowing coral rosebud, and a gathering of peaches and cream hypericum berries. These flowers are available and affordable throughout the year, although the bright green tones are especially lovely when used in spring and summer weddings. Other apple green flowers that will add a crisp focal point to your groom's boutonniere include hydrangea, dendrobium orchid, lisianthus, and carnation. Keep in mind that all shades of green act as a versatile neutral, and pair well with both colors at the opposite end of the color wheel like orange and red, as well as with similar tones like yellow and blue. Although there's nothing uncommon about roses in wedding flower arrangements, you can make a rose boutonniere stand out by adding unusual flowers to complement the rose. Spiky flowers like sea holly, with their steel blue heads, provide quite a contrast to the soft lush petals of a rose. Other flowers with strong architectural features that make interesting rose pairings include celosia, gomphrena, and protea blossoms. In the language of flowers, the orchid represents love, beauty, and refinement. The orchid is also a Chinese symbol for many children! What an auspicious beginning for a fruitful marriage. All symbols aside, orchids make lovely boutonniere foundations due to their exotic appearance and longevity as cut flowers. An orchid does not need much embellishment in a boutonniere; a small addition of grass or leaves is sufficient. While any orchid can be used in wedding flower arrangements, you're most likely to find dendrobium, cymbidium, and phalaenopsis orchids in use at the florist. Let's face it, some men are very reluctant to wear pink. Especially unapologetic bright pink, not at all tinged with purple or red. However, when the flower choice for the boutonniere is a sleek and modern looking calla lily, rather than a ruffled rose or frilly lily, pink haters are less likely to condemn the hue. Other ways to make pink more palatable include pairing it with brown or black (ribbon, foliage, berries). If that doesn't appease the groom, remind him that his willingness to wear pink shows the bride how great her new husband will be at the art of compromise. Thanks to the timeless elegance of brides like Kate Middleton and Grace Kelly, lily-of-the-valley has become an iconic flower choice for wedding arrangements. However, the flower can be difficult to display effectively because of its diminutive nature. What better place to flaunt this little beauty than at on the groom's lapel? Here, the petite flowers don't need to compete with larger blooms like peonies or hydrangea. As a bonus, the bride can enjoy its sweet perfume when she rests her head on hubby's shoulder at the end of her special day. Some boutonnieres look as if the florist took a last minute pluck of the bride's bouquet, and fastened it to the groom's lapel. However, every exquisite detail of this boutonniere lets guests know that the groom's floral accessory matters just as much as the bride's. A miniature red calla lily, a lush rose, and a Peruvian lily blossom form an elegant trio in this boutonniere. None of these flowers is expensive or rare, yet the combination of shapes and textures gives it an appeal greater than the sum of its parts. Is this arrangement artistic, or fussy? Make sure you convey your aesthetic clearly to the florist with lots of sample photos and conversation to make sure your ideas are properly rendered in the final floral product. 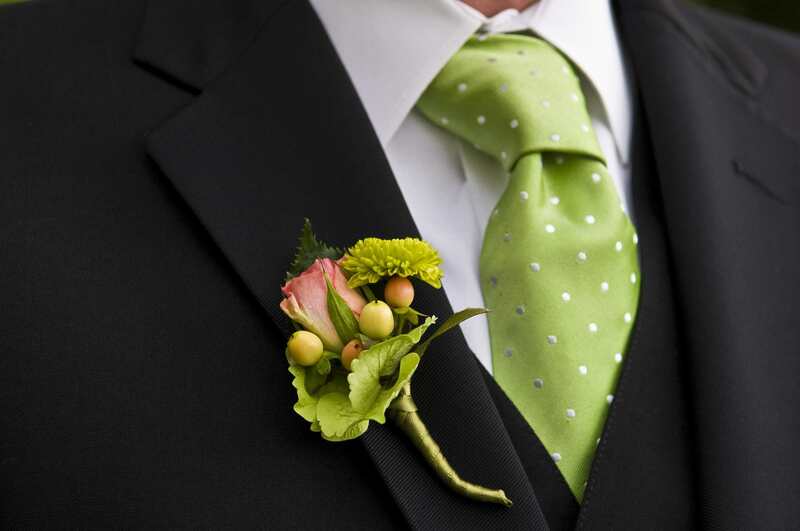 The boutonniere is often touted as a way to display a favorite hobby of the groom. Fishing lures, golf tees, and even miniature musical instruments or tennis rackets may find their way into customized boutonnieres. Other ways to add a personal touch include using the birth month flowers of the bride or groom. If the word craspedia doesn't exactly slide off the tongue, it might be easier to ask for than the cheeky alternative name "Billy balls" (who thought that one up?). Whatever you call them, these charming sunny globes aren't going anywhere, and are turning up in summer wedding flower arrangements in increasing numbers. Craspedia flowers have a rustic appeal that pairs well with low key flowers like chamomile, bachelor's buttons, scabiosa, and speedwell. Wedding flower arrangements don't require far-flung or exotic floral elements to be special. Sometimes, a bloom from the garden delivers just the right touch. For example, you're unlikely to find sedum on the list of most florist's go-to wedding flowers, but this very long-lived and reliable garden plant yields lovely pink flower clusters that fit right in with the accompanying pink rosebud. Other sentimental garden favorites waiting to find inclusion in a DIY boutonniere include daisies, coneflowers, and lavender. Fall is the time for jewel tones to shine, both in wedding accessories and flowers. Calla lilies offer a wide range of hues to suit an autumn wedding, and two-toned flowers like this orange and gold bloom seem to be carved right out of a sunset sky. A few sprigs of fall berries are a natural fit for any September or October wedding flower arrangement. Don't limit yourself to hypericum berries, explore other choices like dark, moody elderberries or greenish-gray brunia berries. Using berries in your boutonnieres not only adds textural interest, it can also lower the cost of wedding flower arrangements. Small pine cones and ornamental peppers are other colorful options for boutonnieres.